SAS/AF lacks a Timer class. This sample class demonstrates how a Timer class can be simulated using sleep() to time slice while waiting for events. 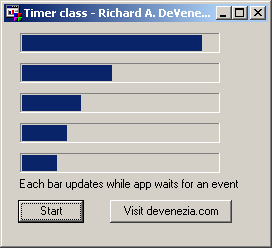 The Timer class schedules actions by using time slicing. A looping sleep occurs while there are no SAS/AF events pending. When an event is pending the looping stops. A Timer must be restarted after events have been serviced. Additionally, the looping will halt if an action returns a non-zero value. SAS/AF applications are single threaded. Thus, only one Timer object can be active at a given time. The application is responsible for restarting the timer after an event has been serviced by the AF executor. This class uses Action objects. Actions are scheduled for execution by registering them with a call to addAction(). An error will occur at runtime if an object registered for scheduling does not have the requisite method and attributes. action() should execute quickly. Timer is a crude emulation of a real timer (which is not supported by AF executor) and may be subject to stutters. Consider Action object SelfControl that subclasses a ProgressBar. When action() is called the bar will update. The bar will proceed from 0% to 100% every barTime seconds. Now use it in a frame. When the Start button is clicked Timer simulation will begin and the action method of SelfControl will be called every 5 milliseconds. Every 5 milliseconds ? Take a closer look at Timer. When addAction was called a SelfControl was added to queue actions. Then start gets called. After a short nap the actions queue is iterated. Each Action that has timed out has its action() called.